Oldham Council recently came out in support of the global agreement to tackle climate change which recently took place in Paris. Oldham Council which manages a borough with both the highest birth rate and migrant population percentage increase in Greater Manchester is fantastic at these empty gestures that create the illusion of a green sustainable economy. The Council choses to ignore and dismiss the external generation of CO2 associated with all the demand that a a single human being makes on energy infrastructure from birth through to death. America, China, India in fact all of the worlds largest economies are also the worlds largest polluters and have the highest levels of population and manufacturing industries. While Oldham Council brag of the largest biomass-fuelled district heating network in the UK people with local knowledge know that the heating network has existed for decades and subsidises St Mary’s estate. This is an area with Oldham’s highest levels of benefit claimants and worklessness and over 60% more children than the England average and this new biomass boiler replaced a traditional fuel fired boiler that had reached the end of its useful life. The new system was intended to be fuelled by waste products such as wood chippings hence the name biomass but is actually being fuelled by the regular gas network due to cost constraints so is neither green nor cutting emissions. Displaying nonexistent green credentials to those in society who show nodding dog compliance at your every word belies the environmental destructive policy Labour Oldham have heaped on Oldham, Chadderton and Saddleworth. Decades of encouraging and cultivating mass immigration, unnatural population expansion levels and a culture of non-contribution have led to their policies to destroy undeveloped green land to build warehouses, housing and schools rather than redevelop old sites or use brownfield sites to maintain a balance. Rushed through Council at the eleventh hour was a new Solar photovoltaic system for Tommyfield Market Hall that had to be agreed by Council on the 22/12/2015 and installed by the 15/01/2016 due to the Government announcing on the 17/12/2015 a reduction in the feed in tariff for new installations in 2016. 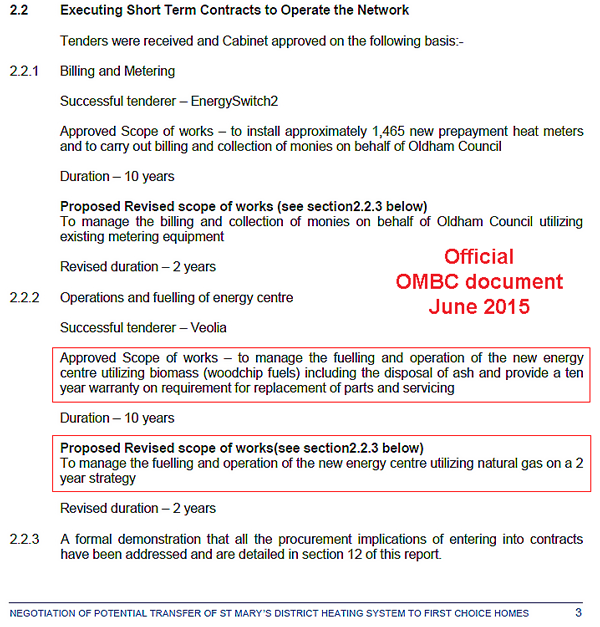 This meant Oldham Council creating another £117,875 in public sector prudential loan debt to fund the scheme. The feed in tariff is heavily subsidised using tax-payers money but is being cut because last year the uneconomical incentive scheme for solar power reduced carbon at a financial cost of £380/tonne almost double the cost of offshore windfarms at £200/tonne. The pillars of local power will never mention how long it takes to compensate for the energy used and the greenhouse gases emitted in photovoltaic panel production which requires the mining of silicon, chemical treatments and huge furnaces to refine raw materials.